As an educator, I have long aspired to teach by turning students on to extreme, compelling storylines and whenever possible, fusing those with actual experiences to ultimately give students pause about why they do what they do: The Story Approach. The very bizarre, strange or extreme can often reveal the ordinary right in front of us. For example, my favorite way to introduce human physiology in my biology classes was to immerse students into the extreme world of the remarkable physiologic event known as the Tour de France. If you can begin to understand how a human can ride a bike (something most of us ordinary folk do routinely) -- but for three weeks through all kinds of hellish conditions at the extreme pace of 25 mph -- you will have excellent insight into the normal functioning of heart, lungs, muscles, kidneys, etc. The unethical use of PEDs just amped up the opportunity to learn more biology and get immersed in bioethical issues along the journey. The opening hook was to challenge my students to ride a bike for just a tenth of a second at 25 mph on the school track. None could! They would all say, 'Whoa, how do those guys do it?' They were hooked. It was easy and fun from there -- they loved this way of learning. 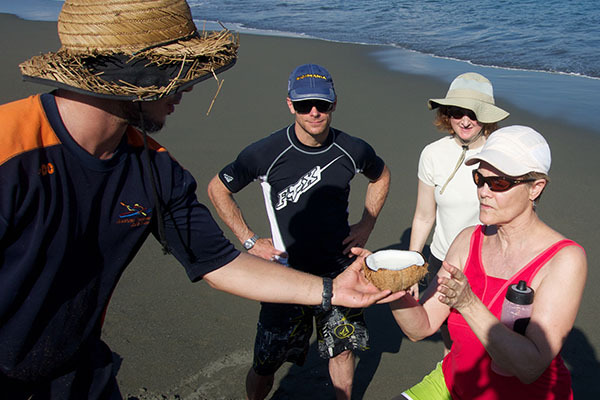 I now get to practice my educational approach by working with a group of like-minded educators and guides to create eco-immersion expeditions for schools, friends and families in places like Costa Rica, Ecuador and Spain. These are extreme places and fabulous 'classrooms!' Eco-immersion goes way beyond eco-tourism, penetrating the superficial that defines tourism and even eco-tourism, guiding the traveler deeper to visionary people at the center of the riveting stories which are what truly animate the wonderful countries where we specialize. As a biologist, I have always had a fascination with the brain and behavior and a wide array of symbioses. Brain Coral represents at first blush a nice fusion of those interests as, of course, all corals are mutualistic symbioses -- literally communities of small animals-polyps and algae living in union. Although they have no real brain, some fascinating species actually resemble one -- such as the open brain coral -- Trachyphyllia geoffroyi. I shall use this wonderful, communal creature as a metaphor for an expedition we recently completed -- a symbiosis of a Yoga Retreat and an Eco-immersion expedition, which truly opened the minds of all involved in this new type of intricate relationship. The expedition relationships were forged amongst five "species" in this intriguing symbiosis -- clients with a yoga practice at home who were willing to try a new approach to yoga and to travel; Kyle Williams, an excellent yoga instructor and owner of Awaken Yoga in Media, PA; our Chill Expeditions naturalist, adventure and cultural eco-immersion guides Andrea and Brian; Toby and Lauren Cleaver, the owners of Iguana Lodge set on The Pacific, Osa Peninsula, Costa Rica; and various local collaborators including remote indigenous villagers, a waterfall and tree rappelling jungle family, and community organizers we found ideal to work with in order to maximize the opportunity for our travelers. Kyle, Andrea and Brian worked to immerse travelers in morning and evening integrated yoga sessions which would best set up the travelers to prepare, engage with, debrief, reflect upon and then connect the dots amongst the wide array of extraordinary local activities all done collectively as a group. 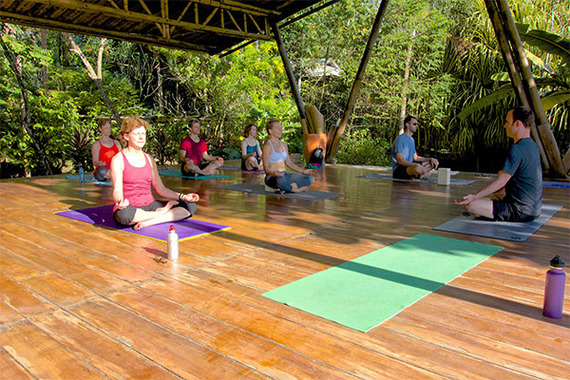 The Cleavers have hosted dozens of classic, traditional Yoga retreats over their 15 years of operating the spectacularly situated and tranquilo-vibed Iguana Lodge. These routinely feature yoga in the morning and evening, and then clients are on their own or perhaps doing a few one-off activities over the course of the week. 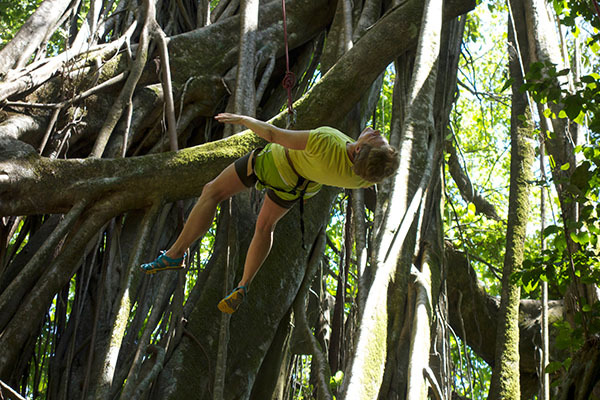 These can be pretty cool, but we were after a more authentic, locally engaged experience -- a more compelling mutualism which would both enhance the yoga and infuse the other activities with a thematic storyline. We aimed to craft the elements into one coherent living, breathing 'organism' so-to-speak. Our own gorgeous, open-minded 'coral!' Yoga instructor Kyle was extremely happy with how 'yogic' the entire experience was, explaining that "The root word of yoga is to yoke, as in to unite... uniting mind, body, spirit for example, or places, community and people... our Chill Expedition united a variety of perspectives, activities and practices into one cohesive, shared week of engagement. Uniting such diverse elements was very special... I cannot wait to do it again!" Iguana Lodge owner Toby was also very excited at the outcome of our symbiotic experiment, noting, "It was in fact inspirational for us... definitely raised the bar... it is hard to even group them with other yoga retreats because of the richness and depth... never seen a retreat that was so well thought out and prepared so that the yoga experience had meaning through out the day. 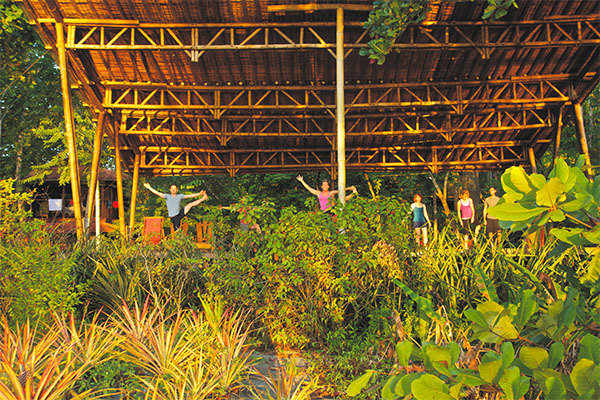 The daily yoga practice was thematically integrated with the day's activity... first yoga group that had community service as part of its program... everyone left with real sense that they had a great adventure filled with yoga, culture, wildlife and a sense that they were part of something special." Darwin and evolution would have been impressed at the outcome! Most creatures take a longer time to evolve a niche. As an educator with a passion for Earth's special places as incredible classrooms for 'students' of all ages, it certainly gave me pause to witness this symbiotic experiment become such an instant success. Unlike natural selection, which is endlessly creative, but not intentionally planned, it is amazing what open-minded, passionate folks can do when they are committed to giving their clients pause. We forged a new travel niche. We all know that adding diverse elements together is not always successful. It is often times far from it, whether in natural history, politics, on a team or especially in your travels. If you can evolve an intentionally symbiotic approach to both your education and your travels and best yet, if you smartly fuse educational travel elements into an eco-immersion type experience, you will be deeply rewarded. For a sublime experience, dare to make it a yogic, open-minded expedition! Life is too short not to maximize your investment and turn your travel into something way beyond a vacation and your education into something way beyond a school. Be one, at least metaphorically, with that inspirational, open brain coral!